A sales call script can be your best friend or your worst enemy. Used well, it’s your guiding light to navigate a conversation. But abuse it and you become a telemarketing robot that sweats when forced to go off-script. Look at it this way — a cold call script is a shoulder to lean on, not a crutch to carry you. Personalize it to the person, role, and account you’re prospecting to, and tweak it according to what works. Try this handy tool that books calls for you without the back-and-forth. First thing’s first: Write an outline of what you want to say. It’s the best way to make sure you hit the right points during your call. 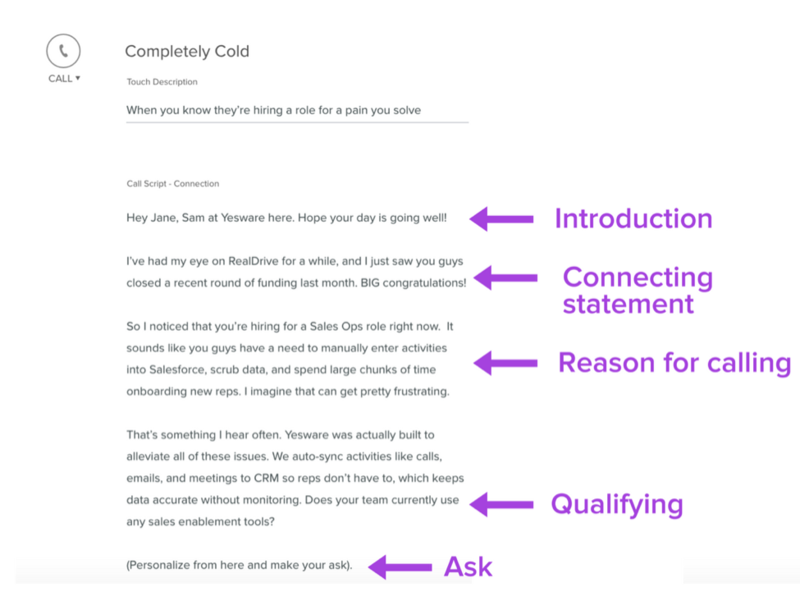 (Keep reading for sales call script templates examples to copy/paste) Remember, your goal isn’t to pitch someone on the spot; it’s to get them to commit to a meeting. Next: Choose the right time. If you’re not sure where to start, try Tuesday or Thursday afternoon. A Yesware analysis of over 25,000 calls made through our phone dialer discovered this is the best window. We found that sales calls lasting over five minutes most often occur 3:00 to 5:00 PM on Tuesdays and Thursdays. Whatever time you choose, make sure to block it off on your calendar. Ready, set: Time to call. When it’s go-time, remove any visual distractions so you’re fully present to lead the conversation. Here’s what you’ll need: your prospect list (ideally with prior research about the person), your sales call script, and a place to jot down call notes. Try one of these science-backed steps to boost your confidence. There are plenty of do-not’s when it comes to making a cold call. Don’t be sketchy about who you are or why you’re calling. Mystery buys time but can bite you later. Don’t talk at your prospect. Use questions to connect early on. Don’t give up if you don’t reach them the first time. It’s the marathoners who get the worm. Don’t just use the phone; “Double tapping calls with emails increases your chances,” says Yesware Sales Manager Joel Felcher. Don’t paraphrase what your prospect does. They already their job. Instead, impress them with how well you know their pains. Following up by email? 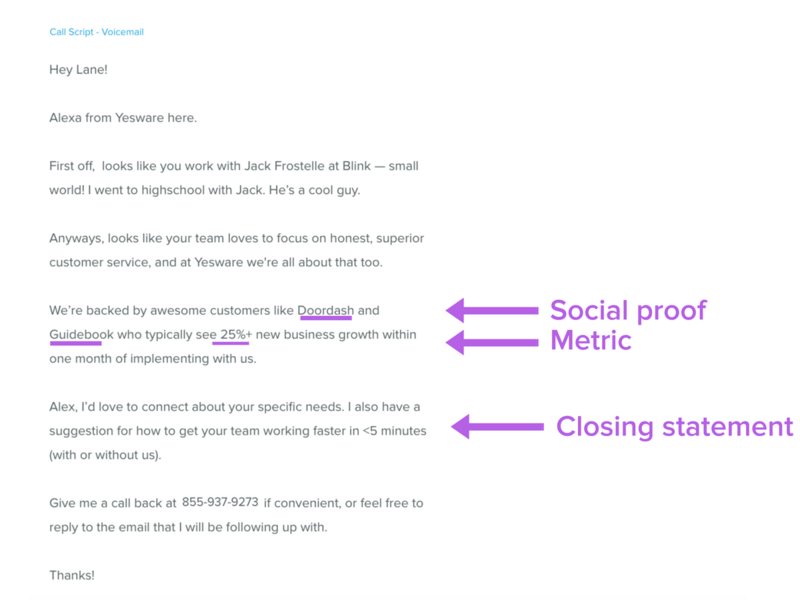 Here are 18 proven email templates. 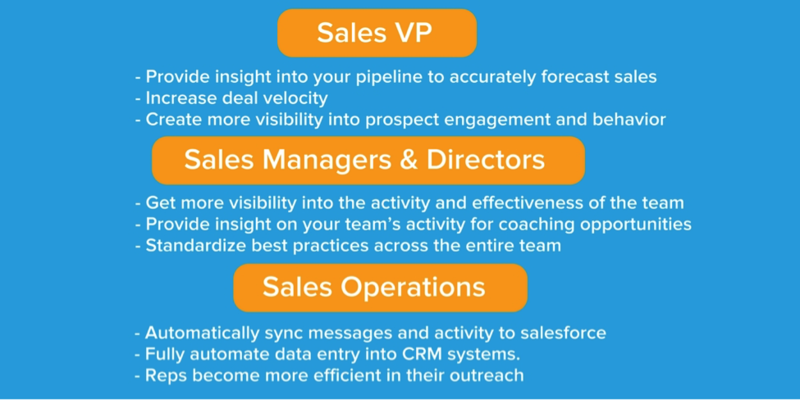 A use case: The sales call script that prospects everywhere are begging you to stop using. If you’re calling someone who’s never talked to you before, they will likely be on the defense. How do I actually benefit? Your sales call script needs to answer these questions truthfully while keeping the biggest cold call haters on the line. You both share a similarity. You and this person have something in common—a background, a hobby, or a piece of knowledge. Maybe you went to rival colleges, or are big fans of tattoos, or have worked with the same person in the past. Or it could even be a person. Facebook recently proved that the degrees of separation between strangers is smaller than we all thought; it’s only 3.5 people. Finding your commonality (and bringing it up in a natural way) makes you more attractive to your prospect. First, take a couple minutes to research your prospect online—the person and the company. Find a compliment or a specific pain point; your acknowledgement of this intimate fact can serve as your bond. Click here to copy this script to use on your own. The prospect you’re calling is a person with a real job, with real needs and frustrations. Connect with that reality. Prove you aren’t just cycling through selling activities with your own agenda. Every cold outreach that I’ve ever given 15 minutes of my time to was because they were memorable, and because I didn’t feel like a tally number on a board of “calls made.” Every single one was about how they could add value to my business in a way that others couldn’t. Want to get me to talk to you? Learn something about me, and deliver it in a way that resonates. 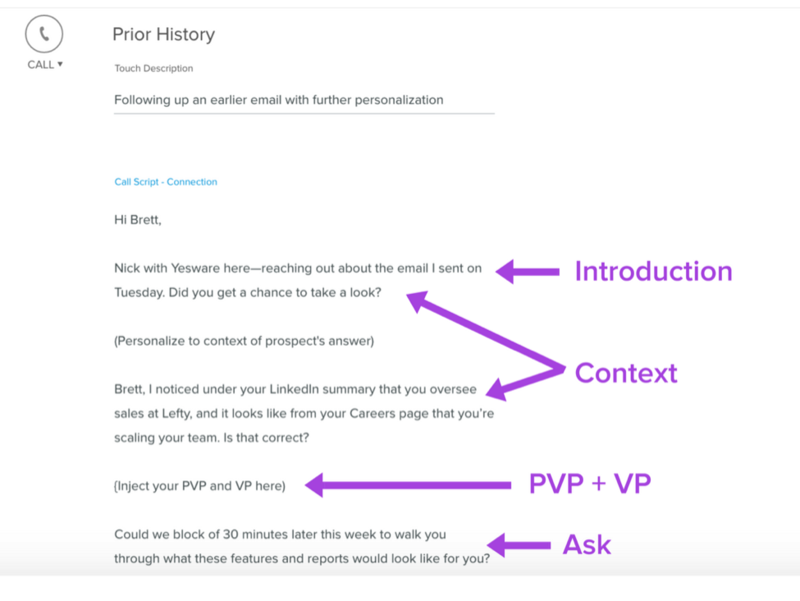 Dubbed by Art Sobczak’s book Smart Calling: Eliminate the Fear, Failure, and Rejection of Cold Calling, PVP is an important concept. It helps you stimulate your prospect’s curiosity, keep them talking, and book a meeting. What does their daily world look like? How are they measured? How can you impact that? As it relates to what you offer, what do buyers want? What do they want to avoid? When you’re developing your own PVP, think about value as a result of your product. (Hint: It isn’t just the product in itself.) Show them the end-goal. And don’t just talk at them—engage with the person you’re talking to by asking questions. The best way to bury an objection is to use the Best Friend Formula. You show your prospect that you’re on their side, just like their best friend would be. Relate — Show that you understand and emphasize. Bridge the gap — Offer new information that makes it easy to move forward. Notice how he didn’t fight the objection head on? 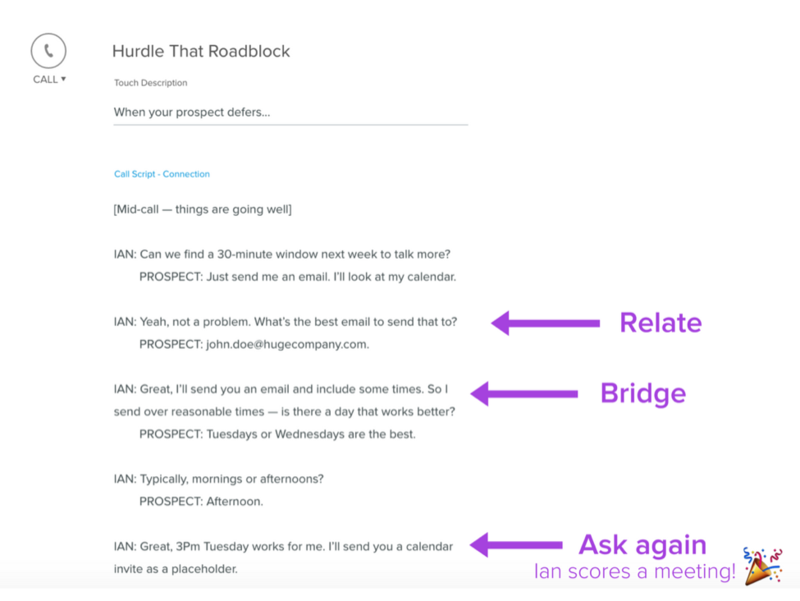 Ian worked with his prospect to get to the end-goal together — well done. Click here to copy this script to use when your prospect defers you to email. When your prospect doesn’t pick up, leave a carefully crafted voicemail. Think of it as an audio email, and keep it to 20-30 seconds. Don’t worry about a reply; just focus on continuing to nurture your prospect’s trust in you. Want to guarantee that your voicemail is heard beyond the first five seconds? Then insert your connecting statement at the beginning, right after you say who it is calling, and end off with a note that triggers curiosity. A closing statement that sparks curiosity and is scientifically proven to drive action. That’s all we’ve got for now with the scripts. What about you? What sales call scripts have you had the most success with? Are there approaches you’ve learned to steer clear of? Tweet us: @Yesware.